Robi 1GB IMO Pack @Tk 49 For 1 Month! Enjoy buffer-free HD video calling in IMO manager with the 4.5G network of the country- endorsed by IMO. The most popular video calling app is best experienced in Robi. 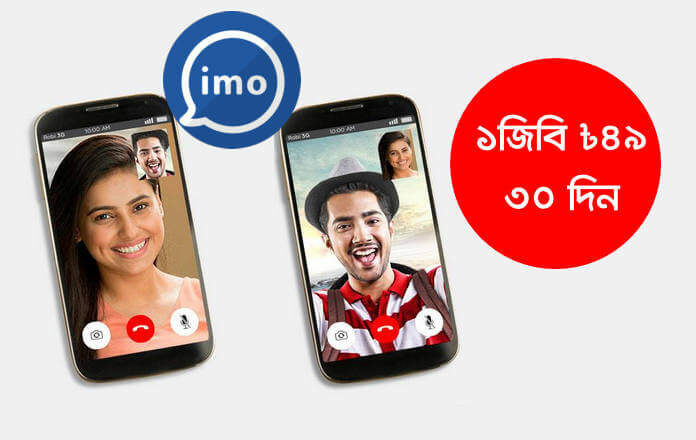 Robi gives the best Imo Video Calling Experience in Bangladesh, This is a good offer for IMO messenger user. For those who use IMO messenger, this offer is absolutely perfect, 1GB internet is only 49 Taka 1 month validity. You can check more Mini IMO pack by Clicking Here. 1GB internet can be used only for IMO messenger, Robi social IMO Apk internet package 2019. 1GB IMO Pack at Tk49 and validity is 30 days. Robi all subscriber can accept the IMO internet offer. This data can use only IMO messenger. Video call can be used for all purposes including audio call record. A customer wishes to buy this offer. There is no limit for daily use. Dial *3# for data check. Including VAT, SD & SC. Buy this pack from online.